Your opportunity to progress to the half bank / half boat final. Registration forms are available in the from Myland at the fishing hut. Assemble in the car park from 9.00am. Run by Andy Hathaway and catering for a maximum six participants. Once this session is full Andy will arrange another one and he is looking to hold one session per month during the warmer months. Thames water have generously agreed to waive the fishing charge for the day, so all of the £20 entry fee will go to Haven House. Like last year, lunch will also be provided. 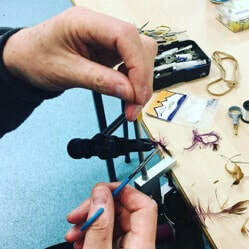 Hosted by Tony Fox and Kevin Blackwell, these evenings will cater for fly-tiers of all levels, from beginner to advanced, as well as being a good social evening and a chance to chat about fly-fishing during the colder months. Equipment and materials will be supplied, but if you wish to bring your own please do. Both Tony and Kevin are experienced fly fishers, as well as tiers, so there will be plenty of advice on tap, especially about how to tackle Walthamstow reservoirs.